It’s all about boost and takedowns. Normally, a race requires a finish line. In a game like Forza Motorsport or Need for Speed, you're tasked with hurtling between two points or completing a certain number of laps before your opponents. Not so with Onrush, the next title by racing specialist Codemasters. Instead, you're fighting for points in a range of bombastic modes centered around a chaotic swarm of drivers. Outrageous crashes occur every second alongside ridiculous speed boosts and a death-defying medley of jumps, flips and barrel rolls. It's like the peloton in cycling's brutal Tour de France mixed with Mad Max and a monster truck rally. The team behind Onrush used to be called Evolution Studios. Under Sony's stewardship, the British developer made six World Rally Championship games for the PlayStation 2 and four MotorStorm titles for the PlayStation 3 and, in the case of Motorstorm: RC, PlayStation Vita. In 2014, it tried to kickstart the PlayStation 4 with Driveclub, a realistic racer centered around six-person teams, or "clubs." While the game was praised for its dynamic weather and meticulously recreated cars, a rocky launch -- plagued by server problems and a delayed PlayStation Plus version -- meant it never gained much momentum. In March 2016, Sony decided to close the studio. A month later, however, the team was picked up by Codemasters. Yearning for a fresh start, game director Paul Rustchynsky looked at classic arcade racers, such as Burnout, which rewarded players for narrow misses and driving on the wrong side of the road. "We're huge fans of Burnout 3, in particular," Rustchynsky said. The game's mechanics raised the tension and reduced the time in between each nail-biting moment. You didn't have to wait three turns for a chance to overtake the person in front; you could just veer left, squeeze between some taxis and hit the boost button. 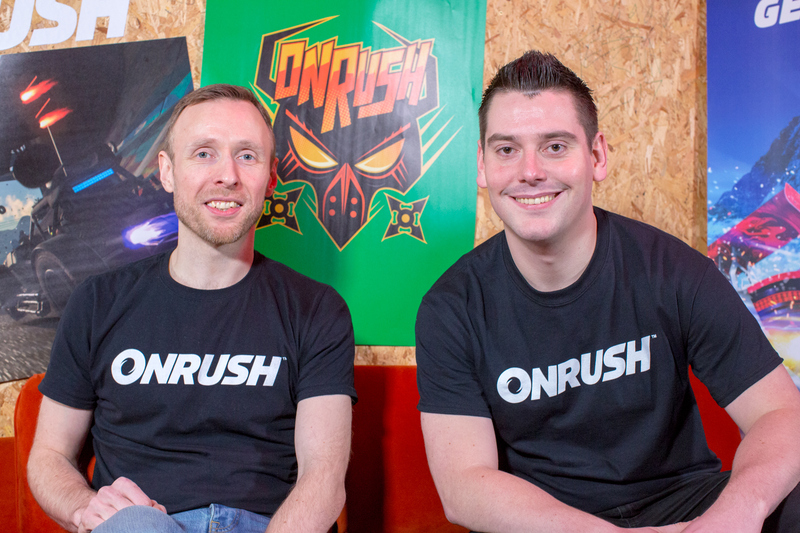 Paul Rustchynsky, Onrush game director (left) and Jamie Brayshaw, assistant game director (right). The studio wanted to do something new, though. So it looked at co-operative shooters such as Overwatch and Team Fortress 2, which offer different character classes with unique strengths and weaknesses. "We knew we wanted team-based racing," Rustchynsky said, "that's something we wanted to bring into the action straight away." That sort of teamplay, however, was more complicated and ambitious than the simple head-to-head racing of Driveclub. It would require complementary abilities and careful balancing like a roster of Street Fighter characters. Still, the team took to the challenge and began prototyping a six-versus-six arcade racer. The idea of a swarm or "stampede" that you constantly spawn into came later. One employee was talking about "drop-in, drop-out co-op" as a way of pairing friends up in between races. But then the rest of the team suddenly realized: What if you could literally drop into a game while the action was still underway? The feature is common in first-person shooters such as Battlefield and Call of Duty, but rare in conventional racers. That's because it wouldn't be fair to join a Nascar championship on the final turn, after players had spent hours jostling for position. It required a major rethink. The team's solution was a gameplay net, nicknamed the stampede, that contains 12 human and 12 computer-controlled drivers. If you crash or fall too far behind, you're instantly thrown back into the fray with everyone else. It meant changing the nature of the game, however. Instead of a chequered flag, Onrush has a bevy of unusual gameplay modes. One of these, Overdrive, tasks two teams with collecting a set amount of boost. While it's tempting to race near the front of the pack, the smarter bet is to hang back and look for weaker vehicles that are easier to take down. "That's what brings it to life. That multiplayer principle of just launching people right back into the action." Countdown, a time attack mode inspired by Out Run and other arcade racers, requires a similar mindset. Each team has a timer that can only be replenished by passing through neon gates. Your first instinct is to hammer the boost button, but it's better to focus on takedowns and blocking other players. And if you crash into a tree or get taken out by another driver, it doesn't matter because the respawns are so darn fast. "That's what brings it to life," Jamie Brayshaw, assistant game director explained. "That multiplayer principle of just launching people right back into the action when they get taken down. That unlocks ways to embrace the crash, to celebrate the crash and the takedown." Onrush has a heavy emphasis on team play, too. There are eight vehicles to choose from, each with unique abilities that can affect the flow of a match. Outlaw, for instance, is a boost-stealing motorcycle vulnerable to larger vehicles. Interceptor has an extended Rush -- a second-level boost that builds over the course of each game -- while the bulky Titan can shield other racers. Understanding the classes and how they should be used in different modes will be pivotal online. While it's possible to compete solo, high-ranking matches will be won by teams with smart compositions. Onrush will have a Superstar campaign for players who want to learn the different classes or avoid the hyper-competitive nature of the internet. At a preview event in London, I was able to try out the first 10 or so events. These had a mixture of Overdrive and Countdown objectives, coupled with optional challenges that included barrel roll and takedown quotas. At first I was utterly flummoxed as trucks smashed into my car and nimbly dodged my takedown attempts. But slowly I learned the course and the best spots to attack enemy drivers. Successful shunts gave me a full tank of boost and the speed required to be more offensive and influential in each match. Much of the game's strategy revolves around the fodder system. If you fall toward the back of the stampede, the AI drivers will spawn in easy to reach locations. They can't earn boost or takedowns, making them easy targets for motorcycles and other lightweight vehicles. "The fodder were initially going to be competitor-like, so they could drive and take you out and get involved in the action," Rustchynsky said. "But we found that this didn't make the game any more fun. Instead, it was more enjoyable to serve up those regular takedown moments for players of different skill levels." Every track is unique and will be playable in the day, night, sunshine and rain. The studio hopes Onrush can blossom into a long-running service like Rocket League and Overwatch. For now, though, the 60-odd team is focused on the base game that will ship on June 5th for the PlayStation 4 and Xbox One. There will be no monetization "on day one," though the game does have a crate system for unlocking driver and vehicle cosmetics. "All the abilities and vehicles are going to be controlled by us," Rustchynsky insisted. "We want it to be like a lineup of heroes in Overwatch. We want to be able to balance them so that they're perfectly optimized and everyone has an equal opportunity of having fun and success in every single class." I enjoyed the game but question its staying power. After an hour, my interest started to wane despite the steady flow of crashes and takedowns. Maybe I was growing desensitized to the action or yearned for the challenge of human-controlled drivers. Regardless, it left me feeling intrigued but skeptical about the project. Rustchynsky stressed, however, that the game is "still in a beta phase" and will be continuously tweaked. That includes everything from takedown strength to vehicle handling. "We want to make sure that every time you take someone down, it feels natural, it feels right," he said. Those minor adjustments could, after all, be the difference between a breakout hit like PUBG and another Driveclub.